There are 1,500 pigeons in a loft at Thamesmead, South East London. 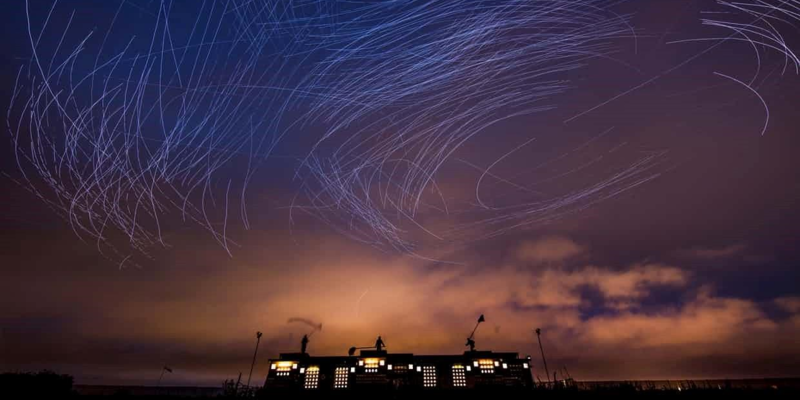 For three nights in June they were the stars of Fly By Night – an ‘interspecies collaboration between a New York artist – Duke Riley and his birds’. Tiny LED lights were attached to the feet of the pigeons, which flew around the loft as the sun set. A major part of this year’s Greenwich and Docklands Festival, the pigeons – and the national press coverage they attracted – are just one sign of change in the air at Thamesmead. Infamous for being the setting for Stanley Kubrick’s film A Clockwork Orange, and more recently for a 20th anniversary revival of Jonathan Harvey’s gay love story Beautiful Thing, Thamesmead is home to an established community of 45,000, and soon to be the setting for a major investment in homes and landscape. Built by the Greater London Council fifty years ago and recently acquired by housing association Peabody Trust, a place that had a reputation for poor-quality 1960s housing, as well as poor transport connections, is now welcoming regeneration and revival with a focus on landscape. It is also benefiting from the speed with which it will be possible to reach central London – from December of this year, Crossrail will connect Thamesmead via Abbey Wood station to central London in twenty minutes. Thamesmead has a legacy of brutalist architecture as well as a landscape that is exceptional. It has extensive green spaces, waterways and lakes. There is 5km of riverbank, 30,000 trees, 7km of canals, six major lakes, three nature reserves and over 350 acres of open space. Much of Thamesmead’s green land is relatively untouched, and wild flowers and woodland have been left to flourish. These areas are teeming with wildlife and birds – Kingfishers, partridges, hares, foxes and cuckoos. Crossness Nature Reserve covers 50 hectares and incorporates some of the last remaining grazing marshes in Greater London. Its wetlands are perfect for wildlife, from barn owls to kestrels to wading birds. Gallions Reach Park is a new park created from land left vacant from the former Royal Arsenal. The park was opened by Peabody in January 2017, offering a new natural habitat environment with wildflower meadows and 800 new trees including black poplar, white poplar, hornbeam, silver birch, ash and Turkey oak. 2018 is the year to visit Thamesmead. As it celebrates both its 50th anniversary and a major investment in restoring the landscape and building new homes, the Landscape Institute is arranging special conducted tours and site visits as part of its conference, Valuing Landscape: Connecting People Place and Nature. Day 2 of the conference – Friday 7 September – will focus on site visits to key locations in East and South East London, including Thamesmead. The visits will look at sustainability, regeneration, place making as well as Peabody’s multi-million pound plans for landscape-led regeneration. Peabody will set the scene with talks on the use of virtual reality in public consultation, clever cities in relation to health and wellbeing, green infrastructure, the challenges of inequality and the future of retail and urban realm. Next articleThe new ‘environmental watchdog’: what should it look like?